Back from BABS-Con in Northern California, and of course we have lots to talk about. But first — we’re still working our way through WonderCon! 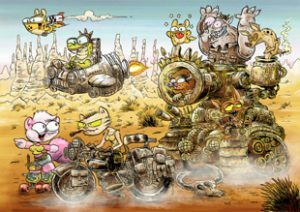 There we met Kristian Horn, the creator, writer, and artist behind Periwinkle Puss — an on-line funny animal superhero comic. “The Periwinkle Puss is the principled purveyor of justice in his metropolis. 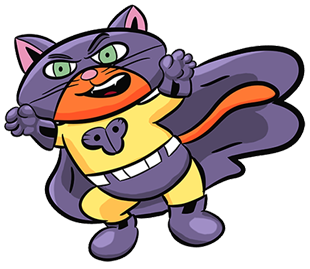 With powerful pride he protects the poor and downtrodden from the parade of criminals that attempt to paint his city with their deeds of paltry nefariousness!” Kristian put out a full-color mini-comic at the convention to guide kitty and superhero fans to his web site. Worked here! 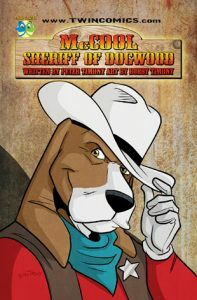 Scruffy Puppies is a full-color science-fiction adventure come created by Brent Trembath (and friends). 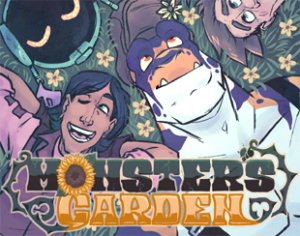 It’s available now on Comixology. 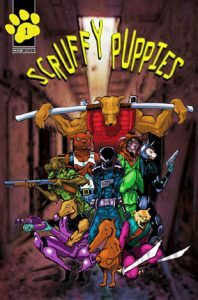 “In the future where humans and mutant animals alike walk the earth… Armor and his pack of Scruffy Puppies are ambushed in a back alley for reasons they can’t comprehend. Power struggles and inner strife underlie the coming of an impending threat.” And that’s just the first issue! The web site has much more information. Someday Mouse is a very introspective and optimistic little mammal. At the Someday Mouse web site you will find this: “Someday is the name of a silent, yet adventurous Mouse; self-made, thoughtful, and always at peace in the moment. If Someday dreams it, then Someday will be it. 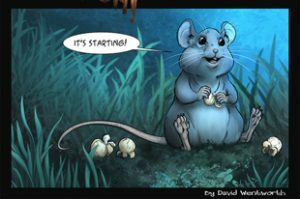 No matter how terrifying the circumstances, Someday Mouse approaches every new experience and creature with unwavering acceptance and genuine curiosity.” You will also find that Someday Mouse is an on-line black & white illustration and thought series written and illustrated by Katherine Brannock. The Adventures of Someday Mouse is also available there as a paperback book. Back from WonderCon 2018, and there is so much to talk about. 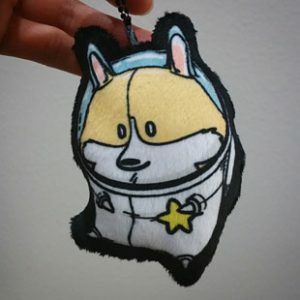 Like… The folks at Corgli & Co describe themselves like this: “The unnoteworthy life & non-adventures of a Blob of Corg & Company.” Actually it’s a web comic following the life of a plump corgi with a different sort of outlook on things. There’s also a Corgli Store with art prints and other funny animal objects. Check ’em out. 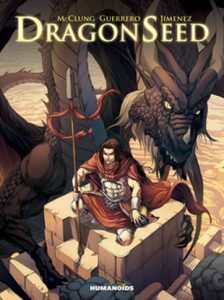 New from Humanoids we have Dragonseed, a full-color fantasy graphic novel written by Kurt McClung (Might & Magic) and illustrated by the team of Jimenez and Mateo Guerrero (Warlands). “For centuries the men and creatures of Krath have prepared for a conflict that many hoped would never happen. A half-blood, Adam Serre Shadow, now has just two moons to find the thief of the teardrop stone, stolen from his fire-breathing father, before the Council of Elders trigger all-out war. The son of a Dragon will stop at nothing to find the magical relic and preserve the fragile peace that still exists between the two species.” It’s available now as a digital comic and as a deluxe hardcover.